This home is worth a visit. 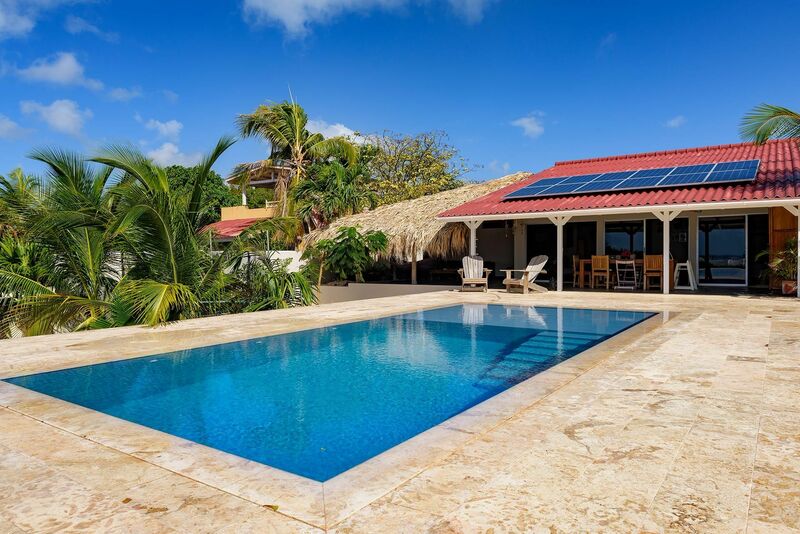 One can only fully appreciate the views, the large pool, the cosy tropical Palapa and the nice cross breezes while visiting this house. 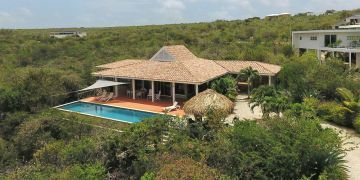 Located on the hillside of the residential area Santa Barbara you are ensured of peace and quietness at any time of day. 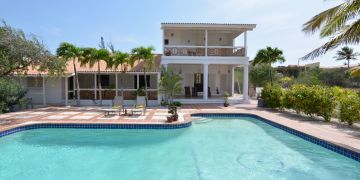 The wide covered porch and roof terrace provides magnificent views over the better part of Bonaire and the Caribbean Sea. Tropical landscaped garden with both indigenous plants & trees and palm trees, white gravel stones and a stone wall on all sides. Entrance via front of the home, front door to hallway, kitchen, livingroom with access to covered terras via multiple sliding doors, small stairs to open hallway, first bedroom with bathroom en-suite, second bedroom with bathroom en-suite, third bedroom (master bedroom) with large bahtroom en-suite. From kitchen acces to hallway, third bedroom/ office room with door to covered porch, guest toilet, garage. 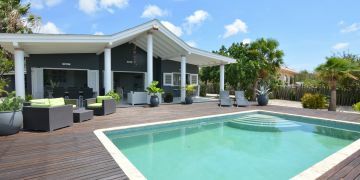 Coverd porch with adjecent Palapa with lounge corner, swimming pool with sundeck, outdoor stairs to roof terrace. poolpomp en filtersystem (magna pool). Registered at the Land Registry Office Kadaster, number 4-A-692.